In interviews promoting Gravity Falls, creator Alex Hirsch cited shows such as The X-Files, Twin Peaks, and The Simpsons as influences on his new Disney Channel cartoon. Those are some awfully big shoes to fill, so it’s to the show’s great credit that its first two episodes make comparisons to past classics seem completely reasonable. The setting of Gravity Falls, Oregon is a wonderfully strange place, full of paranormal creatures that need investigating and eccentric townspeople with their own deeply buried secrets. More importantly, this is a very funny show, one with a sense of humor that often makes you forget you’re watching what is ostensibly a kids show. 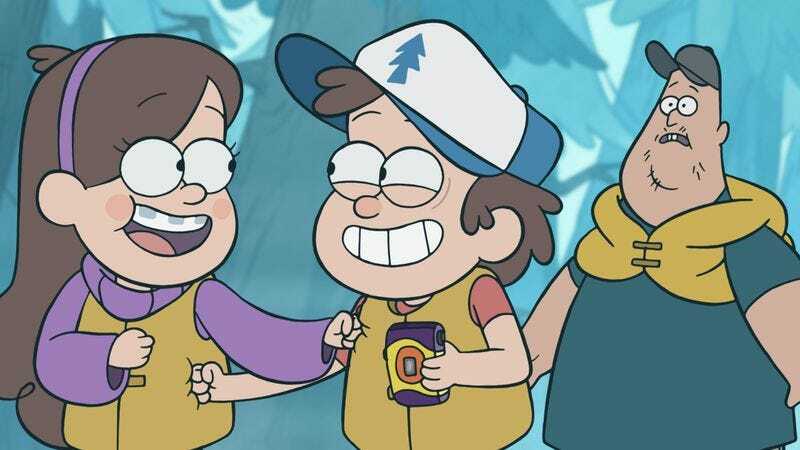 Gravity Falls follows 12-year-old twins Dipper (Jason Ritter) and Mabel Pines (Kristen Schaal), who are sent to the tiny town in the wilds of Oregon to spend the summer with their great-uncle, “Grunkle” Stan (Alex Hirsch). Stan is the proudly sleazy owner of a tourist trap known as the Mystery Shack, which trades on the town’s paranormal reputation by charging suckers to look at various fake oddities like Rock-That-Looks-Like-A-Face Rock, which should be stressed is not an actual face. His two main employees are Soos (also Hirsch), an overgrown man-child who is occasionally smarter than he looks, and bored high schooler Wendy (Freaks And Geeks’ Linda Cardellini), who doesn’t get much to do in these first two episodes but I’m confidently informed will be Dipper’s big crush. In the first episode, “Tourist Trapped,” Dipper discovers a mysterious book that catalogues all the crazy creatures of Gravity Falls and leads him to think the boy-crazy Mabel (emphasis on “crazy”) is actually dating a zombie. He’s half-right, insofar as her boyfriend Norman isn’t human—but he’s not a zombie, he’s actually five gnomes standing on top of each other, and they want to make Mabel their new gnome queen. In the second episode, “The Legend Of The Gobblewonker”, Grunkle Stan’s admittedly terrible attempt to bond with the twins over a fishing trip is interrupted when Dipper and Mabel go off searching for a lake monster with Soos. The rest of the voice cast is fine, though none of them sell their performances the way Schaal does. As Dipper, Jason Ritter doesn’t sound much like a 12-year-old—which isn’t shocking, but it takes some getting used to hearing Ritter’s clearly 32-year-old voice coming out of a cute little kid. It also doesn’t help that Ritter has to deliver a lot of plot-heavy voiceover narration, which I’m sure is useful in communicating the finer plot points to the younger audience but doesn’t exactly play to his strengths as an actor. What he does do very well is bring across Dipper’s high-strung, panicky reactions to the increasingly strange world around him, not to mention his cynical but entirely justified suspicions about whatever Grunkle Stan has planned next—and he hasn’t even discovered Stan’s hidden lair behind the vending machines. Since Wendy only gets a grand total of two lines in the first episode and doesn’t appear at all in the second, there’s not much to say yet about Linda Cardellini’s performance, but come on: It’s Linda Cardellini we’re talking about here. She’ll be great. Hirsch has a lot of fun as Grunkle Stan and Soos, but after the first episode, these roles look like they’ll be vessels for non sequiturs and riffs, which are decently funny but feel overused on kids shows like this. Indeed, if the show has any major comedic weakness so far, it’s an over-reliance on random humor—like Mabel literally spilling a tin of beans and then going, “Beans!”—and some rambling digressions, of which the gnome leader was most guilty (I’m thinking of his “matri-gnomy” gag in particular). The second episode, however, does a much better job of fleshing out Stan and Soos as characters. Stan’s B-plot, in which he grumpily deals with the twins abandoning him and spectacularly fails at making any new friends, is the best example of this. But it’s the revelation that Grunkle Stan’s previous attempt at bonding with the kids—a low-rent counterfeiting operation—left all three in country jail that proves the character’s a keeper. (Mabel’s haunting remembrance that jail was “so, so cold” helps.) It’s an unexpected joke for kicking off an episode of a Disney Channel cartoon; the final pre-credits joke involving the twins cheering about being blindfolded and taken to an unknown location is similarly surprising. That’s edgy material for Disney, but it’s not there just to be shocking—it’s there because it’s really funny. Still, Gravity Falls isn’t as hyperactive and gleefully psychotic as its Disney Channel stablemate Phineas And Ferb, and it’s probably skewing a bit older in its target kid demographic. Partially because each episode is a full 22-minute story rather than a pair of shorter segments, the show feels closer to a juvenile version of a network animated comedy. That isn’t surprising, given the creative team backing up Alex Hirsch. For example, the story editor is Dan McGrath, a longtime TV animation writer who penned a pair of golden age Simpsons episodes, “Boy-Scoutz ’N The Hood” and “Bart Of Darkness.” Series director John Aoshima started as a layout artist on Futurama and latter-day Simpsons before directing 16 American Dad episodes. Then there’s the show’s fantasy and paranormal elements. The first two episodes give us a lot more X-Files than Twin Peaks, partially because we still haven’t really met any of the townsfolk beyond the five people working at the Mystery Shack. The cryptic warnings in Dipper’s book and the final scene of “Tourist Trapped” hint at a complex mythology behind what’s going on in the town, with Grunkle Stan likely right at the center of it. The previews suggest the world will open up and incorporate a bunch more of weird recurring characters, and Mabel and Dipper seem like the perfect pair of supernatural investigators, but this element of the show is very much in the developing stages. One thing the show has done well is mine its paranormal side for comedy, especially in some fun pop-culture gags. Mabel’s earnest wish for Norman to turn out to be a vampire is the first funny Twilight riff I’ve seen in ages, in large part because the joke is about Mabel’s preteen romanticism rather than the show just shouting, “Hey! We’re parodying Twlight now!” The animation of Mabel’s expression coupled with Schaal’s “Please be a vampire! Please be a vampire!” also helps sell the gag, not to mention the wonderfully absurd reveal that Norman is neither a vampire nor a zombie, but rather five gnomes. The end of the second episode nearly veers into a hoary old Scooby-Doo homage, but it sidesteps direct parody in favor of tying the crazy old man’s obsession with communicating with his loved ones through giant robotic rampages to Stan’s hurt feelings at being left alone. It’s a daffy way to state the episode’s message of being considerate to one’s elders, but it totally gets away with being painfully on the nose. Plus, “The Legend Of The Gobblewonker” gets a ton of mileage out of monster-hunters’ notorious inability to get a clear shot of Bigfoot or the Loch Ness Monster with Dipper’s foolproof plan to bring 17 cameras along. The extended bit where Mabel and Soos break a bunch of the cameras for no coherent reason is one of the funniest sustained gags of the night. The show’s animation style is also worthy of praise. The character design is all about soft edges and rounded curves, which helps make Mabel and Dipper look damn adorable. Of course, that same style also helps make Stan, Soos, and the slovenly tourists look… well, they don’t look adorable, certainly. Aoshima’s direction helps sell a bunch of the jokes—in particular, the crazed expressions and googly eyes he gives Mabel in certain scenes are the perfect fit for Kristen Schaal’s line readings, bringing out the idea that, yes, Mabel is more than a little bonkers. If there’s anything that doesn’t work, it’s the giant gnome monster. The animators don’t attempt to make the giant monster look like a bunch of gnomes smashed together. It’s understandable, since it would probably be impossible to animate, especially on a TV budget—but it’s still a bit jarring when switching from long shots to close-ups of Jake the gnome leader. Even so, this is one of the more visual striking cartoons I’ve seen in a good while, something that’s helped by all those gorgeous woodland backdrops. Gravity Falls is already an excellent kids show, and it’s not going to have to do much more to hoist itself into the top tier of youth programming occupied by Phineas And Ferb, Adventure Time, and, yes, My Little Pony: Friendship Is Magic. (For the record, I don’t consider The Legend Of Korra and Young Justice to be kids shows in the same way as these other series.) What’s exciting about Gravity Falls is its potential to go from a kids show that older viewers can enjoy watching to a show that’s enjoyable for older viewers, period. This is a show trying to combine The X-Files, Twin Peaks, and The Simpsons: The results are already impressive, but I’m excited to see what happens when Hirsch, Schaal, and company really get cooking. In what I can only assume is an attempt to create an instant bloc of reruns, Disney is airing a third episode this Saturday at 9:25 p.m. After that, the show settles into its regular timeslot: Fridays at 9:30 p.m.